This is a guest post by Alice Bell. 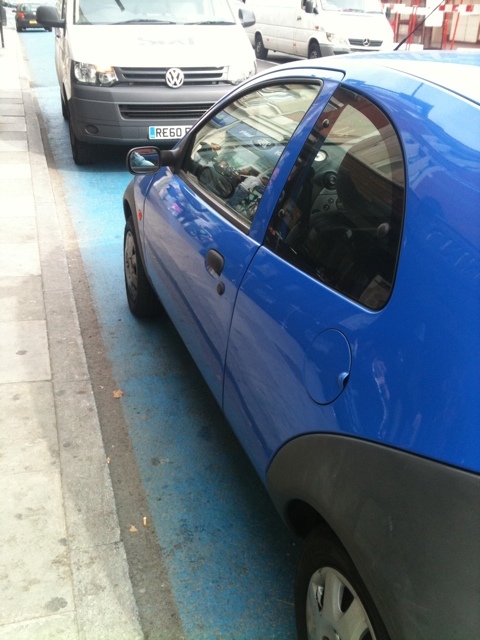 similar strip of standard pavement for everyone else. park makes for a nice pause between Brixton and the Kings Road. sign is just for me. to put a sign up. 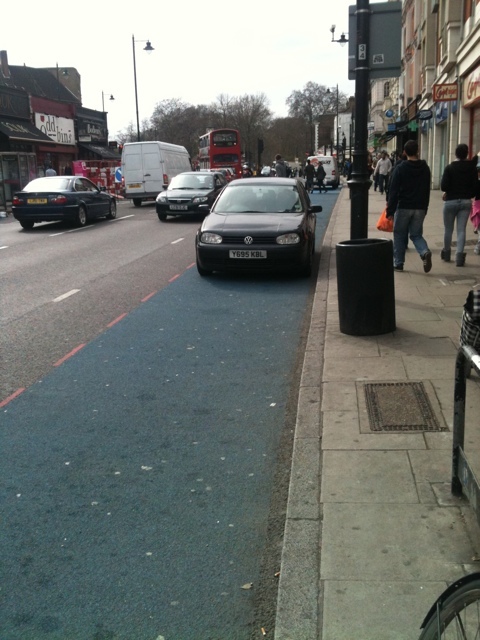 realise we are actually encouraged to cycle in the pavement here. to tell where to go. it leaves ugly marks on the grass. Yours, with love, etc etc. 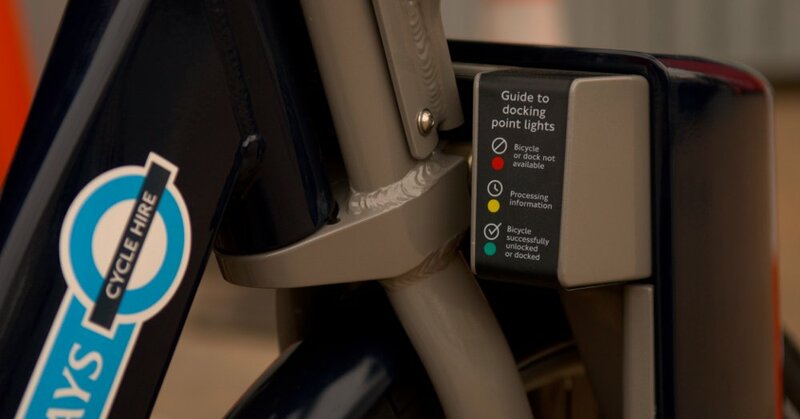 London’s gaudily sponsored Cycle Hire Scheme launches tomorrow. After the seeds were planted during the 2008 Mayoral Election, London will follow Montreal and Paris’ lead in providing docks around the capital from which tourists and Londoners can hire bicycles. 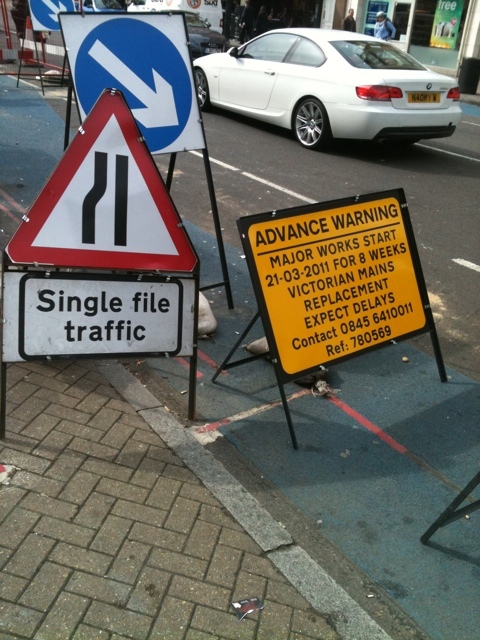 There have been teething problems, notably a month-long delay to the date at which casual users can hire bikes, planning permissions wrangles with London boroughs, and initial software issues with the registration process. For some incomprehensible reason, the map showing where docking stations can be found is not due to go live until the 30th July. 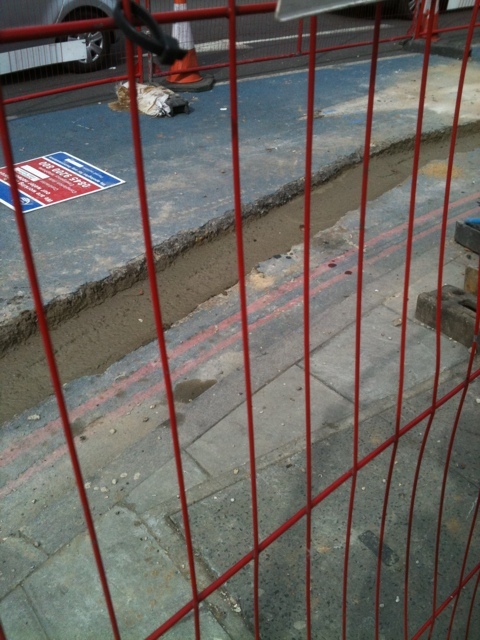 Ever helpful, TfL. 1. The over-zealous branding. 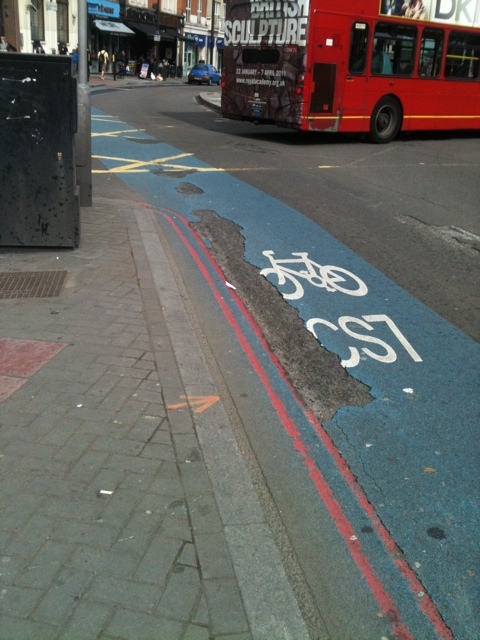 It may not bother some people, but cycle lanes are traditionally green, so painting great swathes of London Barclays Blue rankles. 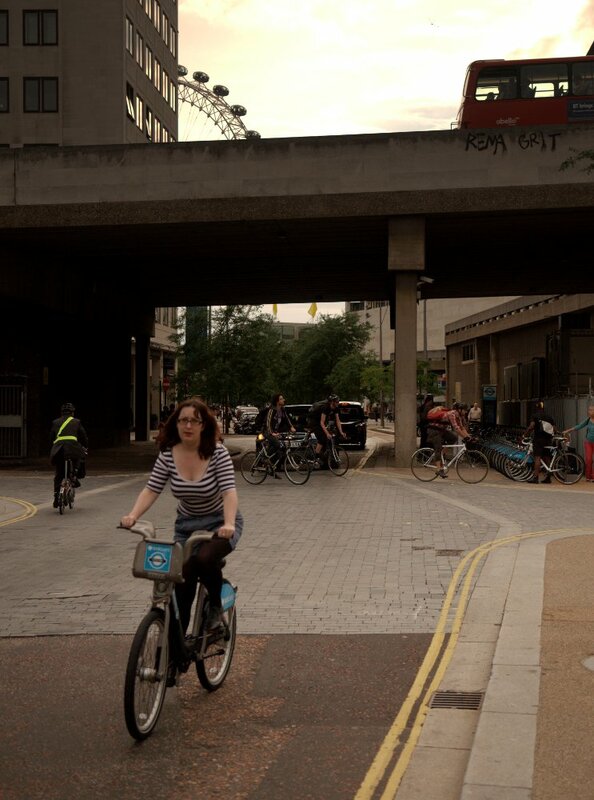 Every cyclist is prone to philosophising on how traversing the streets on foot, or outside of a metal tin gives you a greater sense of ownership of your city. Branding the roads takes that away. Excellent post on this point here. 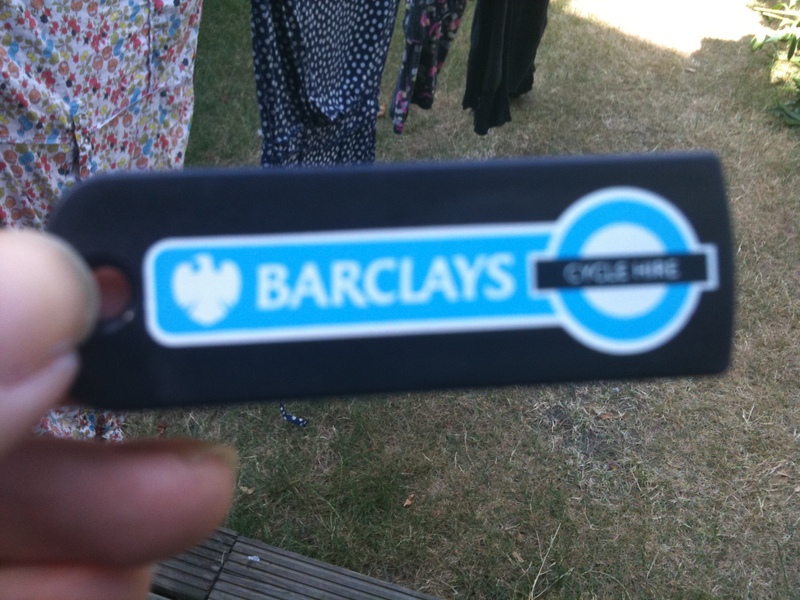 Also, “Barclays Cycle Hire” doesn’t have the same ring to it as “Velib” or “Bixi“. 2. They’re only in Zone 1. I understand they’re primarily to help people get around central London, but there are very few south of the Thames, and installing a few docks at say, Clapham Junction, Balham or New Cross would enable people to commute quickly and cheaply into Zone 1, using the new Superhighways. 3. The sheer weight of them. 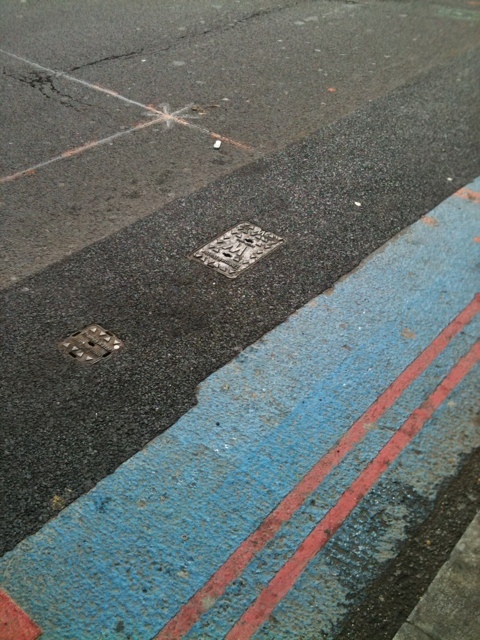 I had a little poke at one in Vauxhall earlier. They’re heavy. About 20kg. This won’t be an issue to everyone: I’m a three-speed, Dutch bike hipster, so heavy is normal. But it takes a while to get used to heavy bikes, and if users without much experience ride straight into the road, turning corners or braking suddenly could cause problems. I’m not sure how adjustable they are either. I’m 5″9′, so I’ll be fine, but I can’t imagine women under 5″4′ having a lot of fun on them. 4. Oyster cards. Why on earth can’t the docks accept Oyster cards? 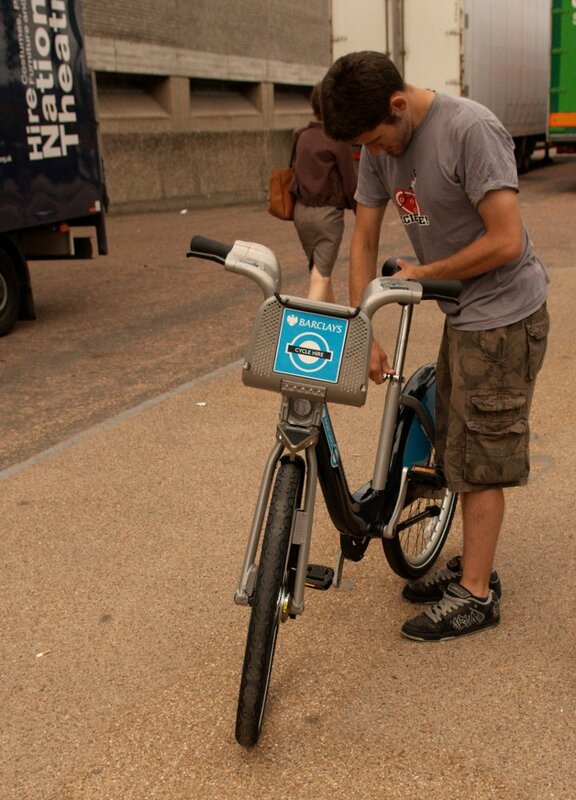 Surely the software can be programmed to only accept registered Oyster cards, removing the problem of people buying an Oyster card, then disappearing with a conspicuously branded bike? 1. The first half hour is free. There have been some gripes that the scheme is expensive, but you can get pretty much anywhere in Zone 1 in half an hour. 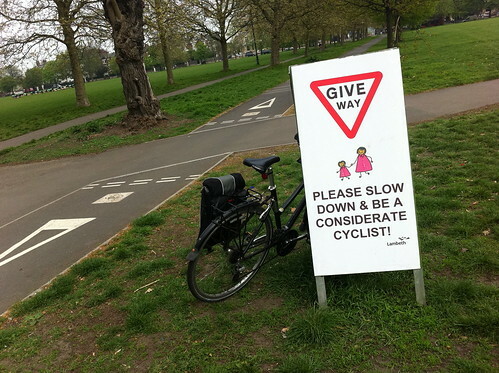 I’m relaxed on a bike, and spend most commutes getting steadily overtaken by the Clapham Cycling Mafia. I can cycle from Vauxhall Bridge to Regents Park in half an hour whilst daydreaming: and it only costs £1 for an hour. 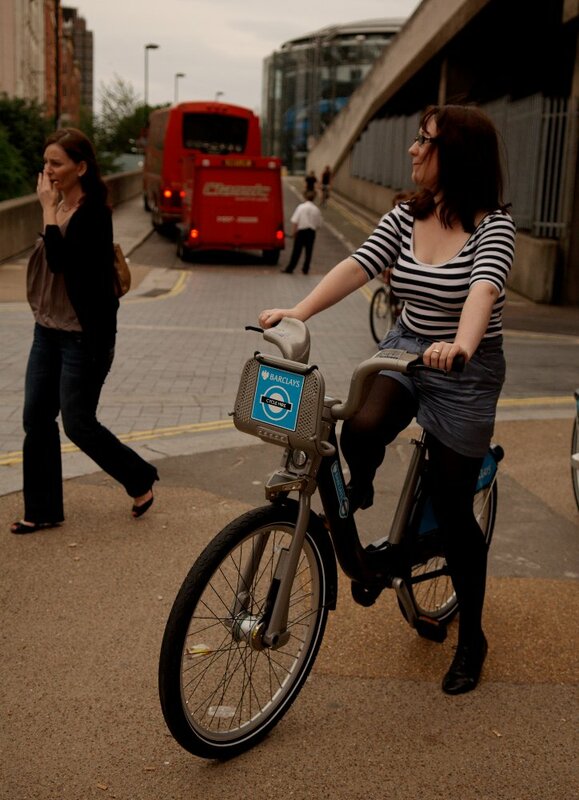 Plus, the average bike hire cost in London is currently around £5 an hour, with the extra hassle of paperwork. 2. There are plenty of docking stations around, and if you find one that is full, you can add an extra 15 minutes to your journey time for free. I might use the hire bikes instead of my own if I’m ambling about the city all day, as it means I don’t have to carry a lock, lights and then return to the original parking space. 3. It’s exercise, and it’s cheap. 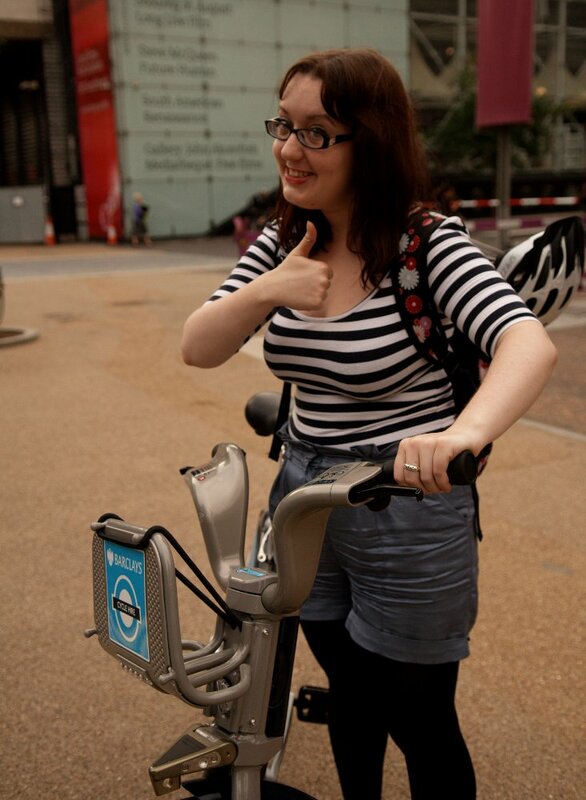 A non-cyclist friend is excited by the scheme, as it’s both cheaper than the gym and a travelcard. He thinks he’ll get a bus to Vauxhall from Battersea, and bike from there. Even with the bus fare, if he bikes for less than half an hour at a time, he’ll have saved at least £2.80 a day. 4. 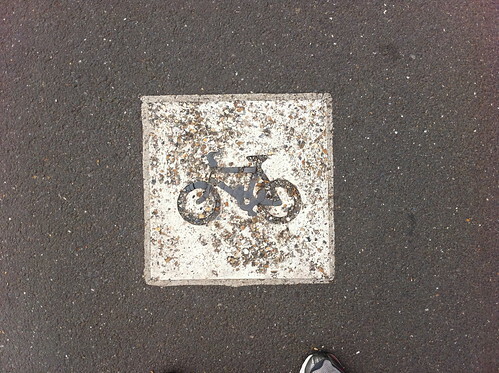 There will be bikes, every where. Cheap bikes. 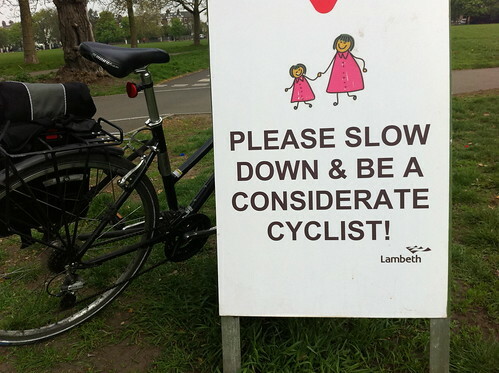 Masses of my friends envy cyclists, and explain how they’d like to get a bike, but they’re not sure if they can cycle, or if they’ll panic on the roads. 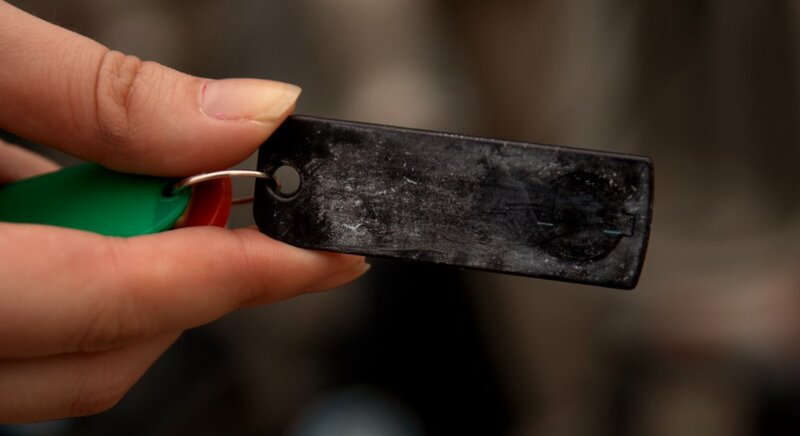 Now they can try them out in their own time, without having to fork out for a bike, accessories and a lock. I’m willing to be optimistic about it until I try it. I think that having registered users using them exclusively for a month is annoying, and a failing of TfL and the Mayor, but I also think that means more enthused people ride first, whilst the kinks are being ironed out. I’d like to think Londoners will embrace the scheme as Paris and Montreal have done, and that TfL won’t screw up too dramatically. We’ll report back tomorrow once we’ve given them a test-drive. Happy Cycling.